It won't be soon that I forget Ilsan, Korea (일산). What is Ilsan? It lies along one of the easiest avenues of approach from the DMZ south towards Seoul. It was my home for one year, 2009-2010. It is a place I still return to an average of around once a year. Many of these times are to visit my friend Jared, who has now lived in Korea ten years, almost all of that in Ilsan. Forgive the extraneous content above. The purpose of this post is to determine "which mountain" once and for all. Ilsan, you see, means "One Mountain" in Chinese, represented by the remarkably simple and intuitive Chinese characters of "一山." So which mountain is that 'one' mountain? This is not as simple a question as it seems. I would note first of all that "il san" is not how Koreans would say "one mountain;" They would say either "Han San" or most likely "San Hana" [한 산; 산 하나]. Chinese numbers ("il" for one) are not used for counting objects in the Korean I know. Perhaps they were a century ago when Ilsan apparently got its name. (There remains a certain arbitrariness to when Korean numbers are to be used and when Chinese numbers are to be used which still trips up even advanced students of Korean. Ilsan Train Station, which is near the old Ilsan and has been a train station for over a century, must offer a clue. I was there to visit Jared this past time, as he works nearby (I didn't work or live nearby in my year there; Ilsan is today much bigger and I lived miles away). Ilsan Station is directly connected to Seoul Station on the Gyeonghui Line, a rail line built by the Japanese in the early 1900s, modernized and fully integrated into the Seoul metropolitan rail transit system since the late 2000s. The time needed from Seoul Station to Ilsan Station is 36 minutes, but trains are infrequent. If you are coming from Seoul and do not get off at Ilsan Station but continue northward, in another 24 minutes you must get off as you have arrived at the present day's northernmost accessible train station on this line, Munsan (문산역) (at 38.85 degrees north [location]). Below you see a scattering of people waiting to board a Seoul-bound train. I had just gotten off the northbound (Munsan-bound) train, boarding on the right. I wonder if it was deliberately planned that the Seoul-to-Munsan duration would be 60 minutes, a round and thus symbolic figure, as if to say: "From the heart of Seoul, to the DMZ in an hour (exactly)." There is actually one more station north of Munsan, called Dorasan (38.90 degrees north) [location], just a few miles from the Kaesong Industrial Zone inside North Korea. Dorasan, being right along the DMZ, is not regularly accessible. If the DMZ ever opens to traffic, Seoul-to-Kaesong through Munsan and Dorasan would seem to be about 85 minutes, and that is by slow/cheap train. Having arrived in Ilsan, I walked towards the main road where Jared works where we planned to get coffee and then lunch as we talked. There was something on my mind that day, but that is another story. Here is the street on which Jared has worked most of ten years (I worked on the same street actually, but a few miles south). This is a few minutes' walk from the station and the road is, according to Jared, a very old one. If we can "one mountain" from here, that would be a good lead. You'll notice that there is, in fact, a mountain in the distance (there rarely isn't in Korea). More on that later. The original Ilsan was just a village around the titular train station, with all you see in the above picture essentially nothing but farmland in the late 1980s. In the late 1980s, the Korean government selected this flat land for the site of a new, planned city, with great success by the 2000s. I lived in Ilsan for just over one year, a long time ago now, 2009 and 2010. Before the Smartphone Age. I knew very little about Korea at the time and had no money. My first two months in Ilsan were with no cell phone at all, I recall, partly because I had problems legally making a contract as a foreigner (without an Alien Registration Card), partly because I felt I didn't need one. This is a good example of how "the Ilsan I knew" was one from which I was pretty disconnected, actually. After talking a while in the coffeeshop, Friday late morning, full of adjummas and almost no men at all, we stopped by Jared's employer, and English institute the name of which is a common term in Buddhist theology. I knew the owner a little from visits over the years. He was a KATUSA, a Korean embedded with the U.S. Army due to language skill. My own place of employment in that year was roughly similar, including that the husband had also been a KATUSA. I taught 5th through 9th graders, and the youngest are now college age. I later did that full-time two more years elsewhere (Bucheon), as (I thought) the money was good. The hagwon Jared works at is on the third floor of this building. I notice the first floor has a phone shop. There are an incredible number of those. The Friday I visited Jared I had a curious phone problem, myself, though not as bad as the one that would befall me two weeks later (the theft of my phone at Texas Street, Busan, with large loss of data and psychological loss that the 2009-Me who went two months with no phone at all would be puzzled at). The phone problem on the Ilsan day was that I had no Korean SIM card at the time on this visit, and I had a guy making business cards for me who told me to call him at a certain time. There are hardly any public phones any more, of course. Jared offered me to call from his work phone, but I declined, with the original intent to find my old workplace. For some reason that didn't happen, and as I realized time was running out I just went back to Ilsan Station, which did have a public phone. I called the business card guy, inquired if the batch was done: he said it was. I went down to Euljiro, Seoul, to pick the batch up before he closed for the weekend. I am embarrassed to admit that I couldn't really figure out how to use the payphone. (I can't be the only one in the late 2010s like this.) It took a few minutes to get it to work. In the meantime, I had seen no other mountains except the one Jared pointed out in the distance in this picture. An Inquiry into the Origin of the Name "Ilsan"
Back to the main question, which has bugged me for years. I intend to not rest until I come up with a substantive answer. Q. If Ilsan means "One Mountain" (it does), which mountain is it? (3) Gobong Mountain [location]. Gobong Mountain (which I have hiked on, has ample traces of military activity/exercises: ditches, trenches, reinforced circular pits for, I presume, artillery), is 2km NE of Ilsan Station but not really visible from present-day Ilsan, all the development of which is on the west side of the tracks. If Gobong is the titular 'one' mountain of Ilsan, it is ironic in that it is not visible to 90%, 95% of present-day Ilsan residents. Jared believes that the 'one mountain' must refer to the mountain visible from the road, Shimhak Mountain. The present-day road has existed for a very long time in some form, a dirt road until the early 1990s. The old village of Ilsan was in the vicinity and so the clear view of this solitary mountain lends itself to the name 'one mountain,' Jared says, which sounds plausible. I have also heard him speculate over the years that Ilsan may have been named arbitrarily by the railroad to give some name to a proposed station. "일산동의 본래 이름은 본래 와야촌(瓦野村) 마을이다. 이곳 ‘일산’이란 이름이 처음 등장하는 것은 일제시대로 일본인들이 경의선 철도를 만들고 이곳에 기차역을 설치하면서 인근의 한산마을 이름을 ‘일산’으로 바꾸면서 사용한 것으로 알려져 있다. 이외에 일산은 이 지역의 고유한 이름으로 이곳에 고봉산과 같이 큰산이 하나밖에 없어 일산이라 부르고 있다는 유래설도 전해온다." "Ilsan District's original name was Waya Village. It was first named 'Ilsan' during the Japanese period during the construction of the Gyeongui Line, when the Japanese erected a train station in the area. At this time, the Japanese renamed Hansan village 'Ilsan.' A common belief further has it that the name was applied because other than Gobong Mountain (고봉산), there is no other large mountain in the area." I am left with two questions: (1) The entry specifies that it is commonly believed (유래설도) that Gobong is the mountain. Does that means no one really knows? What evidence is there for it being Gobong except conjecture(2) Which is more plausible: That the Japanese renamed an existing 'Hansan' to the sinified 'Ilsan' (Han and Il both mean 'one'), or did some Japanese railroadmen create the name outright and this 'Hansan' originally coexisted with 'Ilsan' before the Japanese imposed a sinified uniformity at some later time? There is no record I can see of any "一山" (Hansan or Ilsan) on a late-1800s map of the area, but then there are no small village designations. Perhaps after all this effort I am no closer to a definitive answer. Choi says that the place was also called 한뫼, hanmweh, the latter character (as far as I know) an extinct Korean word for mountain. He adds the surprising twist that this 'Han' we are dealing with did not mean 'One'! The Chinese character used for the name was a different Han, which he says, in a complicated explanation, can here mean 'great,' or 'big/high,' which would fit because Gobong itself means high mountain. Choi says that the Japanese changed the name in 1914. How could the Japanese, who could then, and still can, read Chinese characters and take pride therein, get the intended meaning-according-to-the-Chinese-characters wrong? They changed it from 'high mountain' (Hansan 韓山) to 'one mountain' (Hansan [一山] in Korean; Ilsan [also 一山], sinicized)? I would propose the following as the most likely explanation: The Japanese railroad promotion man in charge of naming the station, or the low-level Japanese government official, or whoever it was who was in charge of sinicizing place names in 1914, understood spoken Korean. He either heard the name orally only (hearing "han san," it is only natural he thought it would mean "one mountain" rather than the other, obscure, Chinese-origin Han discussed at confusing length by Choi above), perhaps because the only Koreans on hand when he inquired about the local village name were illiterate. It was a deeply rural area at the time, after all. Thus the name was transformed. So it was that one Japanese railroad man's or bureaucrat's misunderstanding a century ago stuck the place with the goofy name 'One Mountain'! Let this be a lesson: As some Korean teachers are wont to tell you, "Always check the Hanja" (Chinese character). Everything in South Korea is wonderful. May it be in the city or in a province, South Korea will always have something to offer. Though I haven't been there, I am hearing a lot of great things about the province of Ilsan. 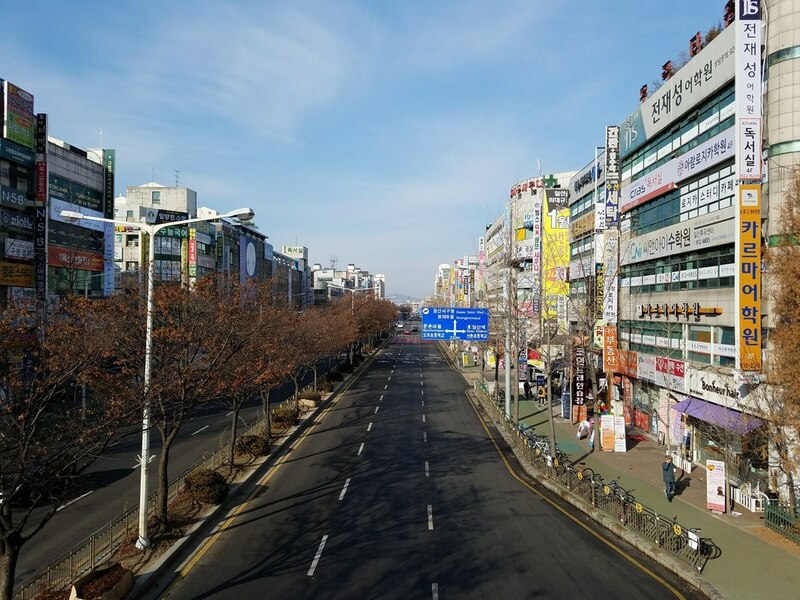 Aside from Busan and Suwon, Ilsan is also a peaceful yet wonderful province of South Korea that is tagged as " a perfect place to visit during Spring Season". After reading this review, I realized that there's a desire for me to be there!